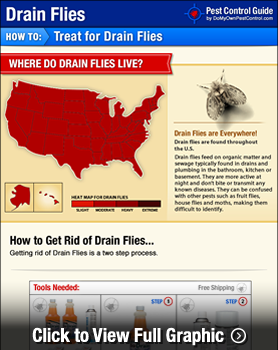 Getting rid of drain flies is usually a two step process, Step 1 getting rid of the debris in the drains that are allowing the drain flies to breed and step 2 actually eliminating the adult drain flies. It can take several weeks to get rid of drain flies and the length of the treatment will depend on the level of debris built up in the drain, the number of drains infested and level of infestation before the treatment is started. Once you've identified which drains are infested, the first step of a drain fly treatment is to start getting rid of the built up gunk in the drains where the drain flies are breeding. It is recommended that you use a drain gel or drain foam to clean and break down this organic matter. Drain cleaner gels and foams are concentrated biological products specifically designed to breakdown organic matter built-up in sinks, drains and garbage disposals and other areas where drain flies harbor and reproduce. Drain Gel or foam should be applied to the infested drains when they will not be in use for several hours, usually at bedtime. Most Drain Gel products recommend that the product be applied to all infested drains every night for at least 5 nights. Drain Gel can be applied one time per week to maintain the cleanliness of drains in areas where drain fly infestations have been an issue in the past. Space spraying is a great way to get control of a fly infestation. This method is generally used for smaller spaces where flies are active. In this video, we will show you just how easy it is! Space spray refers to spraying an aerosol product directly into the air instead of onto a surface. Usually only pyrethrin aerosols are labeled for this use. A space spray may be desirable if you have a space that is too small to use a fogger or if you would like to have a fast knockdown spray on hand for later use. A fogger would be a better if you have a larger area to treat. Both methods are a great choice if you have a lot of fly activity inside and want to kill them quickly. Space Spraying will eliminate any flies that are out during the application but won’t leave behind an active residual. Following the product label instructions, apply the spray or fogger in the infested room. Most space sprays and foggers require you to vacate the room after the application and ventilate before re-entry. Please refer to the product label for re-entry requirements. And it’s that easy with the expert help from Do My Own Pest Control dot com! Subscribe to our channel for more DIY and product videos! After you have started to treat the drains with drain gel, it is time to get rid of the adult drain flies. You can do this with a pyrethrin space spray. Space spray refers to spraying an aerosol product directly into the air instead of directing the product onto a surface. Usually only pyrethrin aerosols are labeled for this use. A space spray is a good choice if you have a lot of drain flies inside and you need to get rid of the drain flies quickly. With this method, you will eliminate any drain flies that are out during the application but you will not leave behind an active residual. Following the product label instructions, apply the aerosol as a space spray. Most space sprays require you to vacate the room after the application and ventilate before re-entry. Please refer to the product label for re-entry requirements. Left over pyrethrin spray can be used to spot treat or direct treat when new drain flies are found. 254 of 266 people found this article informative and helpful.